A chair was left empty for Facebook CEO Mark Zuckerberg at a multinational hearing billed as the "Grand Committee on Disinformation" on Tuesday, Nov. 27, 2018. 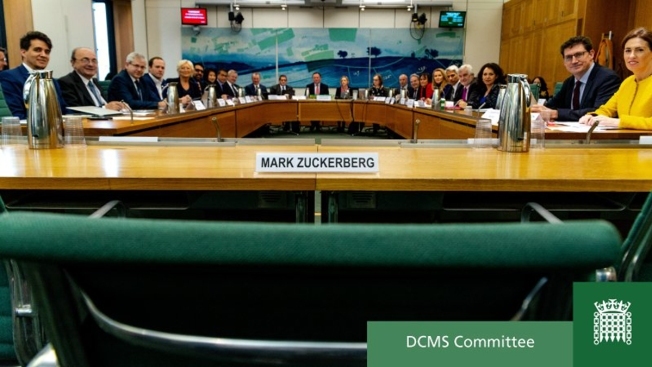 The hearing, at which nine nations were represented, was part of the British Digital, Culture, Media and Sport Committee's investigation into disinformation and fake news. Lawmakers from around the world questioned a top Facebook executive over "fake news" on Tuesday at a hearing that CEO Mark Zuckerberg refused to attend, NBC News reported. Politicians and other top officials from nine countries were questioning Richard Allan, the company's vice president of policy solutions in London. Representatives from the U.K., Canada, Australia, Ireland, Argentina, Brazil, Singapore and Latvia invited Zuckerberg to give evidence, even by video link, but he declined. France and Belgium also attended the hearing. The event was billed as the inaugural "Grand Committee on Disinformation.” Organizer Damian Collins, the British lawmaker who chairs a parliamentary committee investigating disinformation and the use of people's data, said he was "deeply disappointed by Zuckerberg's decision to ignore summons from so many nations." The committee turned up the heat by seizing confidential Facebook documents from the developer of a now-defunct bikini photo-searching app.